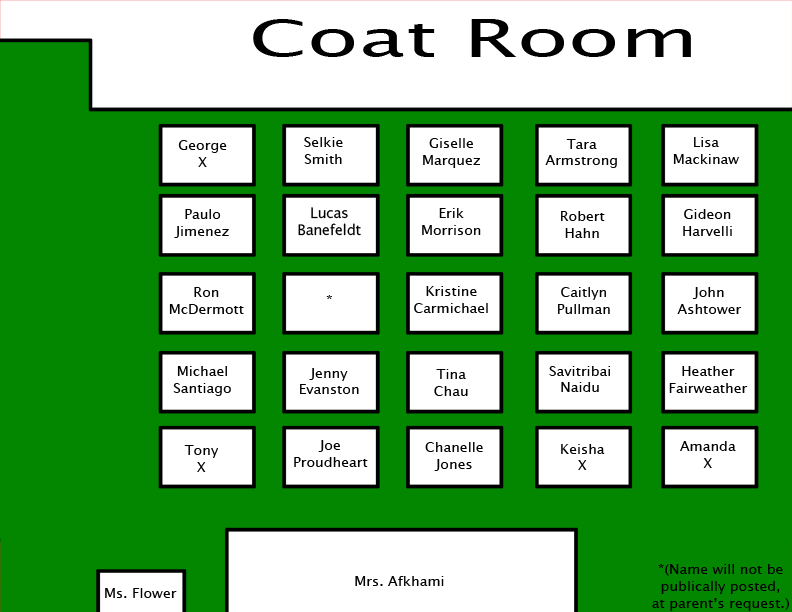 Probably silly to post this a second time, but based on reader feedback I made a few more changes to the seating chart. I replaced the X placeholder name for the orphans that were surrendered as babies with a more realistic placeholder name, Doe. I also realized a backstory mistake I made on the chart. I never mentioned this in comic, but Tony was not given up as a baby, he was given up at age four. So, Tony should have his own last name instead of a placeholder. So, here it is: Tony (well, Anthony) Mollier. I didn't mention it last time due to forgetfulness, but I am playing with no panel borders, based on some critical feedback from one of my professors during a student work critique. 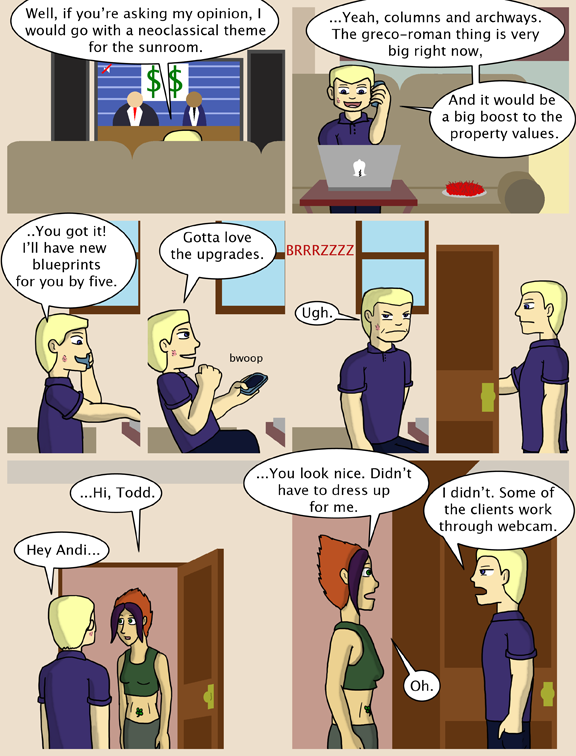 You can just sense Todd’s dislike of Andi. Yeah, that’s what I thought too. Face crinkled up, hands in his pockets, and somehow he just seems more rigid. 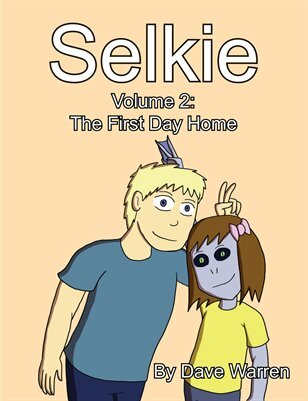 That’s more character than I thought this art style would be able to convey. Like the last two panels alot, they look really good, and as for the no borders….meh, I liked the classic black better. Almost forgot, what’s with the “*(Name will not be posted at parents request. )” thing? I was reading an article on overprotective/helicopter parenting at the time, and had the idea that one of the classmates has REEEAAAALLY overbearing parents. Parents SO overbearing their protectiveness BREAKS THE FOURTH WALL? That’s just awesomely AMAZING. Oh thanks, and that’s hilarious. Forth wall breaking to the X-Treme! Hmm, the “no borders” style looks a lot more fluid. Wow! He still has that kiss mark from Selkie. She must have pretty potent saliva. Andi is a lot taller than I thought she’d be for some reason. Andi has budgie hair. This is IMO a good thing. Wouldn’t his name be Andy then? Plus we’ve seen Andi before, when Todd told her about the adoption. You’re disappointed he’s not gay? Why? Also, I’m liking Todd’s annoyed / angry face. I wonder what Andi did to piss him off? Oh heavens, poor Tony! How much does he remember? And you changed Jenny’s last name. Yeah, sorry. I decided to just give her a normal surname since I was clearing out the other goofy names anyway. At the risk of triggering *yet another* revision of the seating plan: Why did you refer to Georgie by his (presumably) legal name George, but used Tony´s nickname rather than his legal name Anthony for him? Because Tony is what he goes by instead of the more formal Anthony. “Georgie” is more of a nickname instead of a contraction of a true name. Aw man, Andi is hot! Things must’ve been pretty ugly between them for him to get that scowl when she shows up. Hot is meaningless if all you have with it is a personality of s**t. No one really likes hot s**t, no matter what the expression says. Hey, don’t underrate hot s***. It makes good compost and keeps your hands warm in a pinch. Is “Tara Armstrong” a reference to the amazing voice actress “Tara Strong”? Interesting logo on the back of the laptop… is that like a liberty bell type icon (looks somewhat bell-shaped, with a big crack in it)? Looks like it to me. XD I think it’s pretty cool! Yep. It’s a Bell laptop. 😀 As do I! I simply just love her facial expression in that panel. I simply had to turn it into my gravatar. I was hoping you wouldn’t mind. I like it too … 🙂 Hopefully we’ll see it on some other comics’ comments sections … good advertising for Dave. Andi got buuurned. I feel a bit sorry for her though. I’d say it wasn’t a burn. Just a fact. A burn is what is bugging his cheek right now LOL. Or whatever contact miasma Selkie’s saliva has done to him. Todd, you’ve got something on your cheek, there. So what is that tattoo around Andi’s belly button? Looks like a Japanese kanji from here. I swear, given that tattoos are permanent, these two have the weirdest tattoos I’ve ever seen. Happy faces on the shoulders? Although, I suppose, no weirder than any *other* tattoos I’ve seen. I think I like the undefined borders thing… it’s interesting. Good to see you didn’t get rid of Tara Strong. She’s still cool.